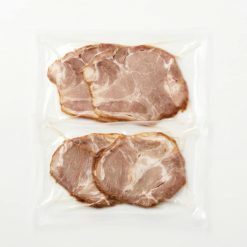 Pork shoulder loins cooked in organic soy sauce to present you with authentic pork slices. The loins were each carefully bound in string and marinated in the seasoning, then backed int he oven. Slices come to about 4 mm, which leaves you with a reasonably thick slice so that you can enjoy texture (typically pork slices for ramen come to about 2 to 2,5 mm slices). 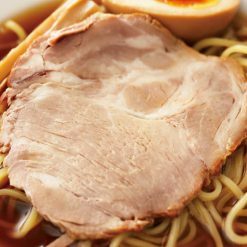 In order for these pork slices to not interfere with the overall ramen flavor, the seasoning has been kept to a minimum. Typically, roast meat is tied before it goes into the oven to keep the form but also retain the juices and fat that come out due to the heat. Commercially sold products of this kind typically use additives such as coloring agents (nitrite Na), antioxidants (vitamin C), modified starch, phosphate (improving agent), casein Na (binder) caramel color (2, 3, 4), etc. Please remove the frozen product from your freezer and thaw in the refrigerator. Once thawed, serve with hot ramen. If you are enjoying the product on its own, then pour hot boiled water over the bag, then remove from the bags to place on plates. If you find that the taste is too bland, please enjoy with salty and savory soy sauce or miso. Additional optional toppings for ramen noodles include corn, sea weed, green onions, menma bamboo shoots, moyashi sprouts, hard boiled eggs and kamaboko- a cured fish cake. This product contains pork (Denmark production shoulder roast), organic soy sauce, miso. This product is not suitable for anyone with allergies to wheat, soy or pork. Origin of ingredients: pork (Denmark). Prepared and packaged in Japan.